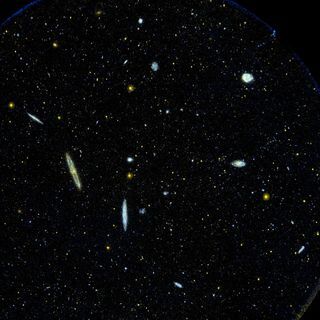 How big is the Universe? It is a question that has always intrigued and challenged astronomers. After all, it is only natural for humans to wonder how far our planet lies from the Moon, the Sun and other celestial bodies. The ancients believed that this distance was not very far at all: they saw the stars as being fixed upon a nearby celestial dome. Over the course of time, however, astronomers began to realize that the size of the Universe is much greater than anyone had ever imagined. Today we know it is so big its limits remain unknown. In the 3rd century B.C., the Greek astronomer Aristarchus of Samos calculated the Earth–Moon and Earth–Sun distances using the angle between the Moon and the Sun at the first quarter moon. His method—based on imprecise data available at the time—estimated that the distance to the Sun is about 20 times the distance to the Moon. Although we now know that the Sun is really about 400 times the distance to the Moon, Aristarchus’ estimate was nonetheless revolutionary because it suggested that the Sun was much more distant than previously believed. 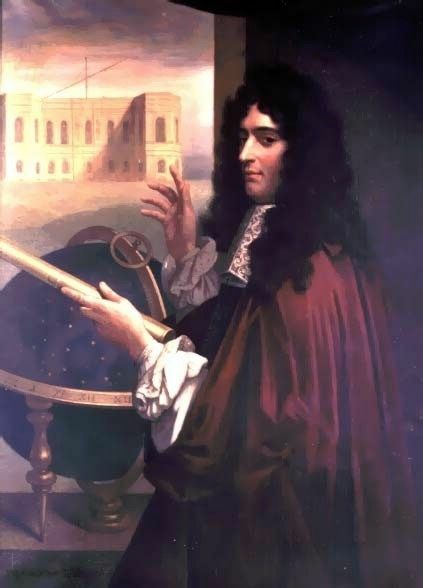 Several decades later, another Greek astronomer, Hipparcus of Nicea, performed an amazing scientific feat by calculating the Earth–Moon distance with an error of less than 10%. He did this using the time it takes for the Moon to pass through the shadow of the Earth during a lunar eclipse, and by applying his own ingenious geometric calculations. Hipparcus also relied on the work of Eratosthenes of Cyrene who had fairly accurately estimated the diameter of the Earth to be 42,000 km (the real diameter is about 40,000 km). The Greek astronomer Ptolemy Claudius devised the first truly reliable method for calculating distances to celestial bodies in 140 B.C. Ptolemy demonstrated how a simple geometric procedure known as parallax could be used to calculate the distance between Earth and other celestial bodies. Even more precise parallax measurements would have to wait until the development and improvement of astronomical instruments. In fact, it was almost two millennia later in 1672 when Jean-Dominique Cassini, a French astronomer of Italian origin, and Jean Richer, a French astronomer, used more modern equipment to precisely measure the average Earth–Sun distance (also known as an “astronomical unit”). Their method relied on simultaneous observations of Mars from Paris and French Guyana. The honour of being the first to measure the distance to a star other than the Sun must be given to the German astronomer Friedrich Bessel. In 1838, he calculated the distance to 61 Cygni as 11 light-years from Earth. These days, astronomers have several methods for measuring distances. 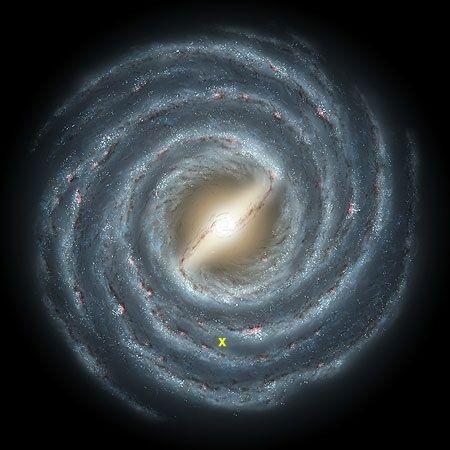 For objects within the Milky Way, most methods employ the method of parallax. For objects outside our galaxy, astronomers use Cepheid variables. A Cepheid variable (named after the star Delta Cephei) is a type of star that displays constant variations in its brightness. Another method for measuring galactic distances uses Type 1a supernovae: stars that generate constant amounts of energy after their supernova explosion. They can be thought of as a “bomb standard”: an explosion of known strength and luminosity. Their apparent brightness in the sky is thus a measure of how far away they are from Earth. Although these types of methods for measuring astronomical distances have allowed scientists to estimate the extent of the Universe, the sheer scale of it is mind-boggling. For example, light from the farthest galaxies takes more than 10 billion years to reach Earth: a truly remarkable distance that is almost impossible for the human mind to grasp. It is somewhat easier to visualize such vast distances if we begin by imagining something smaller, like our own solar system. The solar system consists of the Sun, planets that revolve around the Sun, and millions of smaller bodies. The Oort Cloud, a vast reservoir of comets that circle the Sun, marks the outer limit of the solar system. The distance to this boundary is about 1.6 light-years (recall that each light-year is almost 10,000 billion kilometres). If you can imagine Pluto—the smallest and farthest of our solar system’s planets—as the same size as the head of a pin measuring 1 millimetre across, then the Sun would be as big as two 30-centimetre beach balls lying side by side 2.6 kilometres away from the head of the pin. Going one step further, if the Sun (the double-sized beach ball) was in Vancouver, we would have to travel all the way to St. John’s, Newfoundland, to reach the outer edge of the Oort Cloud! Our solar system lies in the Milky Way spiral galaxy. It is estimated that the Milky Way contains about 200 billion stars gathered in the shape of a disk measuring 100,000 light-years across. At this scale, the size of our own solar system is quite insignificant. In fact, if our entire 1.6-light-year solar system could sit on the head of a pin, the rest of our galaxy would be the size of a hockey rink! The Milky Way is bunched together with more than 35 other galaxies to form a galaxy cluster known as the Local Group. 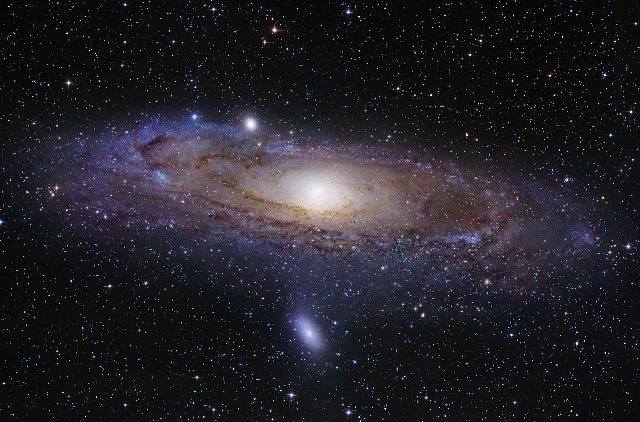 The largest member, the Andromeda galaxy, is visible in a moonless night sky without light pollution. The other galaxies in the group, like the Large Magellanic Cloud and the Small Magellanic Cloud, are typically smaller than the Milky Way. The Local Group occupies an area with a diameter of about 10 million light-years and a centre lying somewhere between the Milky Way and Andromeda. If you can once again imagine the solar system as a head of a pin and our galaxy as a hockey rink, then the entire Local Group would measure 6.25 kilometres across. 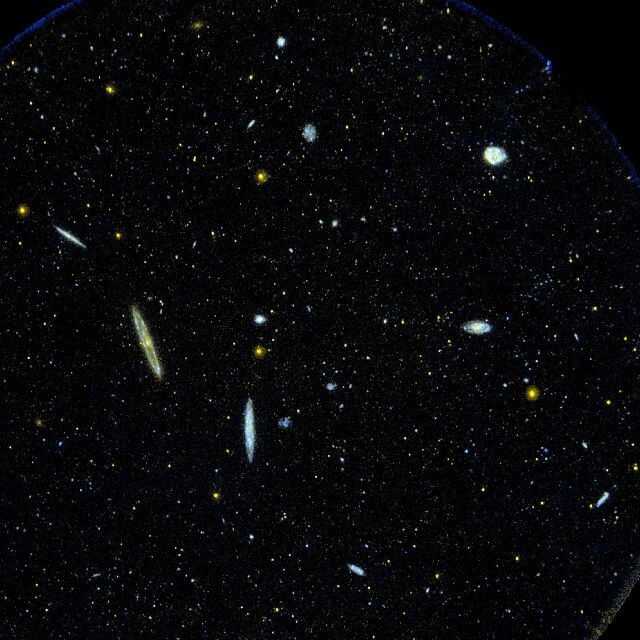 At an even grander scale, the Local Group and dozens of other galaxy clusters are part of a galaxy supercluster known as the Local Supercluster. The giant Virgo galaxy cluster marks the centre of the Local Supercluster at a distance of 50 million light-years. 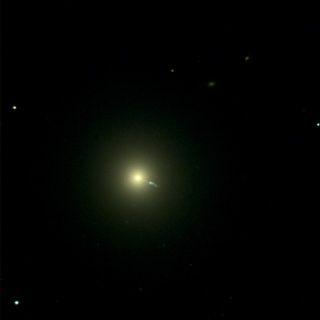 The Virgo Cluster contains a “cannibal” galaxy at its centre—M87—that draws in and absorbs neighbouring galaxies. 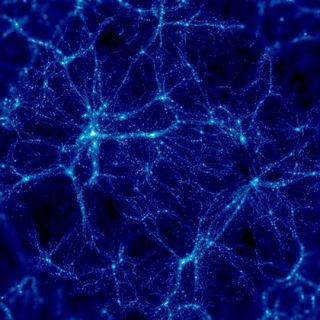 Galaxy superclusters appear to be grouped together along long filaments that stretch out for hundreds of millions of light-years. They are separated by immense voids that contain very few galaxies. The size of these virtually empty spaces is truly incredible—on the order of 100 million light-years. 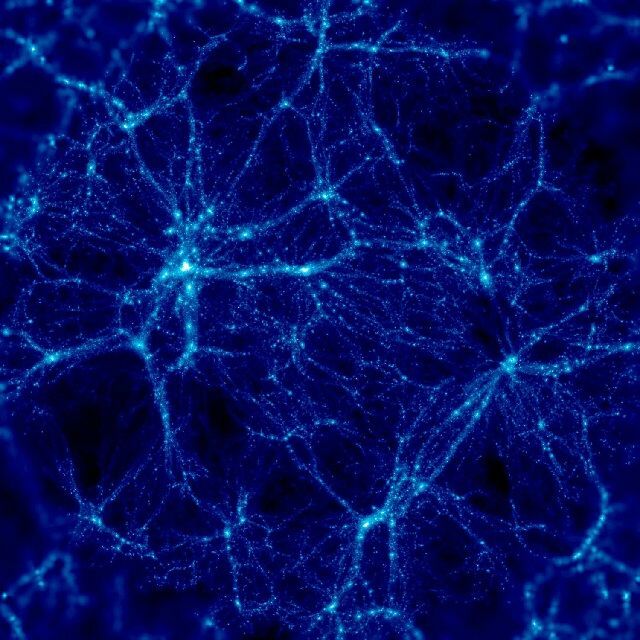 This grand-scale pattern defines the Universe across a distance of about 13 billion light-years. As much as we try, we cannot directly observe what lies beyond that distance. Inviting us on a journey from Earth to galaxy clusters, the following video illustrates our place in the cosmos.